Atherosclerosis which results from gradual deposition of lipids in medium and large arteries is a leading cause of mortality worldwide. The objective of this study was to determine the effect of apple juice on some risk factors of atherosclerosis and on the development of atherosclerosis in rabbits fed a high-cholesterol diet. Thirty two male rabbits were randomly divided into four groups: normal diet, high cholesterol diet (%1 cholesterol), 1% cholesterol supplemented with 5 ml apple juice (low dose) and 1% cholesterol supplemented with 10 ml apple juice (high dose) for 2 month. The C-reactive protein (CRP), nitrite, nitrate, fibrinogen, total cholesterol(TC) and factor VII were measured before the experiment and by the end of period. At the end of study, fatty streak formation in right and left coronary arteries were determined using Chekanov method in all groups. Both doses of apple juice significantly were decreased TC, TG, CRP, fibrinogen, factor VII levels, atherosclerotic lesion in right and left coronary arteries and increased nitrite and nitrate compared to cholesterolemic diet. Also using 10 ml apple juice caused significant reduce in LDL-C and increase HDL-C, but 5 ml apple juice did not change these factors. Significant differences were observed between 5 and 10 ml apple juice groups by LDL-C. No significant difference was found between 5 and 10 ml apple juice groups with regard to CRP, nitrite, nitrate, fibrinogen, factor VII, TG, HDL-C and TC concentrations. Apple juice can effectively prevent the progress of atherosclerosis. This is likely due to antioxidant and anti-inflammatory effect of apple juice. Atherosclerosis is the leading cause of mortality in developed countries. This complex disease can be described as an excessive inflammatory, fibro fatty, proliferate response to damage of the artery wall. Many believe that it can be induced from simple dysfunction of endothelial lining as occurs with hyperlipidemia, hypertension or cigarette smoke [1–3]. Many risk factors are known for this disease and lots of biochemical markers are used to predict and so prevent it in susceptible people. Recent studies have shown that inflammation also plays a key role in atherosclerosis. C-reactive protein (CRP) has been recommended as the marker of choice to monitor cardiovascular risk, being a stronger predictor of atherosclerosis than even plasma low density lipoprotein (LDL) concentration [4, 5]. Inflammation is a prominent feature of atherosclerosis [6, 7], and it is postulated that as an acute-phase protein, elevation of plasma CRP may signal the underlying atherosclerotic process. There is a relationship between some factors of coagulation system such as (fibrinogen, factor VII) and fibrinolytic factors [tissue-type plasminogen activator (t-PA) and plasminogen activator inhibitor-1 (PAI-1)] and the clinical manifestations of atherosclerosis. The relationship between fibrinogen and risk for cardiovascular events is highly proved rather than the factor VII plasma concentration. It has been proved that high levels of factor VII activity effects on the patients with high risk for coronary artery disease and myocardial infarction survivors. It seems that reduced fibrinolytic activity improve the risk of cardiovascular disease . Endothelial dysfunction has been also proved to be a key variable in the pathogenesis of atherosclerosis and its complications. Nitric oxide (NO) which is produced from transformation of arginin to cytroline by iNOS and eNOS enzymes (isoformes of nitric oxide synthetase) is the most important and well known endothelium derived mediator that is responsible for endothelial dysfunction . NO release by the endothelium regulates blood flow, inflammation and platelet aggregation and consequently its disruption during endothelial dysfunction can decrease plaque stability and encourage the formation of atherosclerotic lesions and thrombi . In states of inflammation, NO production by the vasculature increases considerably and contributes to oxidative stress [11–13]. Flavonoids and phenolic compounds widely distributed in plants which have been reported to exert multiple biological effect, including antioxidant, free radical scavenging abilities, anti-inflammatory, anticarcinogenic, etc. Recently there has been an upsurge of interest in the therapeutic potentials of medicinal plants as antioxidants in reducing such free radical induced tissue injury . Apple is one of the main sources of dietary flavonoids that show the strongest associations with decreased mortality. Also, apple is a good source of antioxidants. It contains appreciable amounts of vitamin C and of various phenolic compounds (catechins, phenolics acids, quercetin and phloretin), which also have protective effects. Epidemiological studies have linked the consumption of apples with reduced risk of some cancers, cardiovascular disease, asthma, and diabetes, lipid oxidation, cholesterol and atherosclerosis perogression. In addition quercetin has demonstrated significant anti-inflammatory activity . 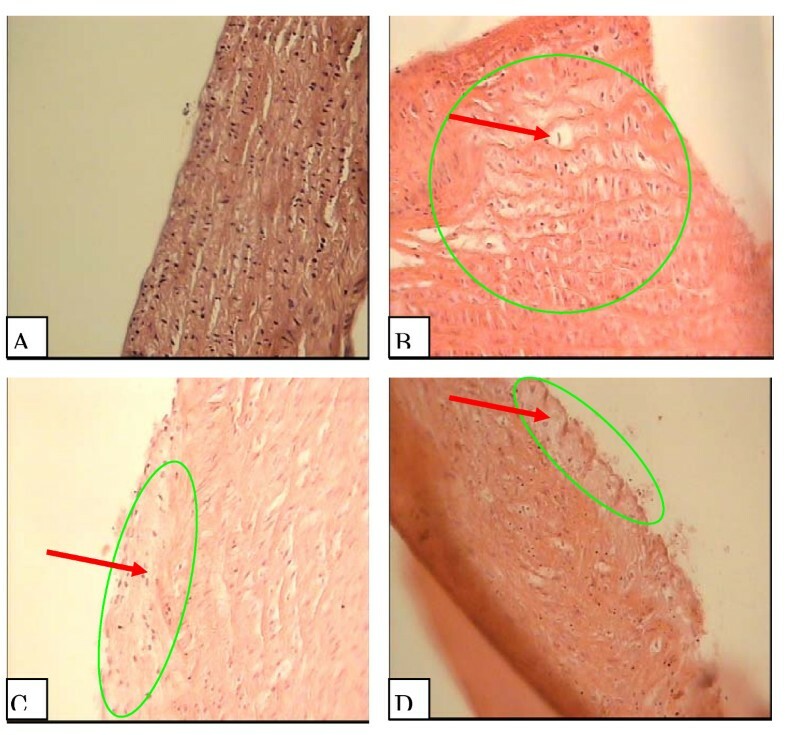 This study was performed to determine the effects of apple juice on markers of inflammation, coagulation, endothelial and progression of atherosclerosis. First the genus and species were verified by a botanist ("Malus Orientalis" with herbarium number of 15811) from the Research Center of Isfahan Province Natural Resources. Then the apples were collected in Aminabad region of Isfahan. In order to standardize the apple juice, some factors such as density, vitamin C, anthocyanin and flavonoids were measured. Thirty two male New Zealand rabbits with an average body weight of 2000 ± 129 g were procured from Razi Institute of Iran. The animals were acclimatized under room temperature and humidity with regular light/dark cycle for two weeks and had free access to water and a standard powdered purified diet (PARS Co, Iran) which consisted of 15% protein, 40-50% carbohydrates, 2% vegetable fat and 15-25% fiber. At the end of this period, rabbits were randomly divided into four groups of eight. Animals were fasted for 12-15 hours and venous blood samples were taken to determine baseline values. After this, each group received one of the four experimental diets: normal diet, high cholesterol diet (%1cholesterol), %1 cholesterol with 5 ml apple juice(low dose), %1 cholesterol with 10 ml apple juice(high dose) every other day. Each animal in each group had daily access to 100 g of pellets. Cholesterol (1 g for each animal, Merck)was dissolved in 2 ml olive oil given to high cholesterol diet animals by oral gavage once daily for 60 days. The same volume of olive oil was given to control animals. Then, the apple juice (5 or 10 ml)was also given orally to animals by oral gavage once daily [1, 16]. The experiment lasted 60 days and the animals had unlimited access to food and water. The study was reviewed and approved by the ethics committee of Isfahan University of medical sciences. After 60 days of experiment, the blood samples were taken again. Blood samples were centrifuged at 3500 rpm for 20 minutes to obtain serum and plasma. The plasma was used for fibrinogen and factor VII measurement and the serum for other biomarkers. CRP was measured using enzyme-linked immunosorbent assay kit according to manufacturer's instructions (Kamiya biomedical Co, USA) and fibrinogen was measured using coagulation kit (Mahsayaran Co, Iran). The serum level of nitrite and nitrate were measured using a colorimetric assay kit (R&D Systems, USA) that involves the Griess reaction and factor VII was measured using clotting time, in the presence of the STA-Neoplastine reagent of a system in which all the factors are present, constant and in excess except factor VII which is drived from the sample being tested (Diagnostic Stago, French). At the conclusion of the study, blood samples were taken from the rabbits again and overdose of sodium pentobarbital and ex-sanguinated were used to anesthetize the animals. Following chest incision, the animals' coronary of arteries were excised to study fatty streaks. After slicing and staining with hematoxylin, atherosclerotic thickness was assessed in hematoxylin stained sections on an arbitrary scale 1-4. Minimal thickness of subintimal with little injury to right and left coronary endothelium. Atherosclerotic thickness less than half as thick as the media with some form of endothelial dysfunction, macrophages and isolated foam cell inside the endothelium. Atherosclerotic thickness half as thick as the media with accumulation of intracellular lipid, macrophage and smooth muscle cells. Atherosclerotic thickness as thicken as the with an abundance of macrophages, smooth muscle cells and connective tissue. Atherosclerotic thickness more that as thick as the media with a large extracellular intimal lipid core that appears as a large nucleus from the endothelial surface . Density was meseared by densitometer, vitamin C assayed by spectrophotometeric method at 520 nm and determined photometrically with 2,4 dinitrophenyl hydrazine to form the red bis-hydrazone which is reduced to a coloreless form . Total flavonoid content was measured by aluminum chloride colorimetric assay. The absorbance was measured against prepared reagent blank at 510 nm . Total anthocyanin was assayed by spectrophotometeric method at 535 nm . Results are given as Mean ± SD. Data were analyzed statistically using One-Way-ANOVA test followed by LSD post test. Differences between the baseline values and the values 2 months) calculated and then used One-Way-ANOVA for comparing between groups. Then pairwise multiple comparisons were performed using LSD post test. In all instances, p value less than 0.05 was considered significant. For histological data, SPSS software was used to compare mean values between the groups. One-Way ANOVA and Tukey tests were used for histological data. After analyzing apple juice factors the amount of vitamin C was 10.7 ± 0.06 (mg/dl), total flavonoids in 100 ml of apple juice 1.36 ± 0.03 (g/100 ml equivalent catechin) and total anthocyanin in 100 g of apple juice 3.05 ± 0.85 (mg/100 g). The density was 1.037 ± 0.09 (g/cm3). Alternation in CRP, nitrite, nitrate, fibrinogen, factor VII, TC, TG, HDL-C and LDL-C concentrations in all four groups were shown in table 1. In high-cholesterol group, CRP, VII, fibrinogen, nitrite, nitrate, TC, TG and LDL-C concentrations were increased significantly compared to normal-diet group and HDL-C was decreased (p < 0.05). Both doses of apple juice significantly were decreased TC, TG, CRP, fibrinogen, factor VII levels, increased nitrite and nitrate. Also using 10 ml apple juice caused significant reduce in LDL-C and increase HDL-C in comparison with hypercholesterolemic diet, but 5 ml apple juice did not change these factors. Significant differences were observed between 5 and 10 ml apple juice groups by LDL-C(p < 0.05). No significant difference was found between 5 and 10 ml apple juice groups with regard to CRP, nitrite, nitrate, fibrinogen, factor VII, TG, HDL-C and TC concentrations. (Table 1). Histological sections of right and left coronary arteries stained from the 4 groups were shown in Fig 1 and 2 respectively. 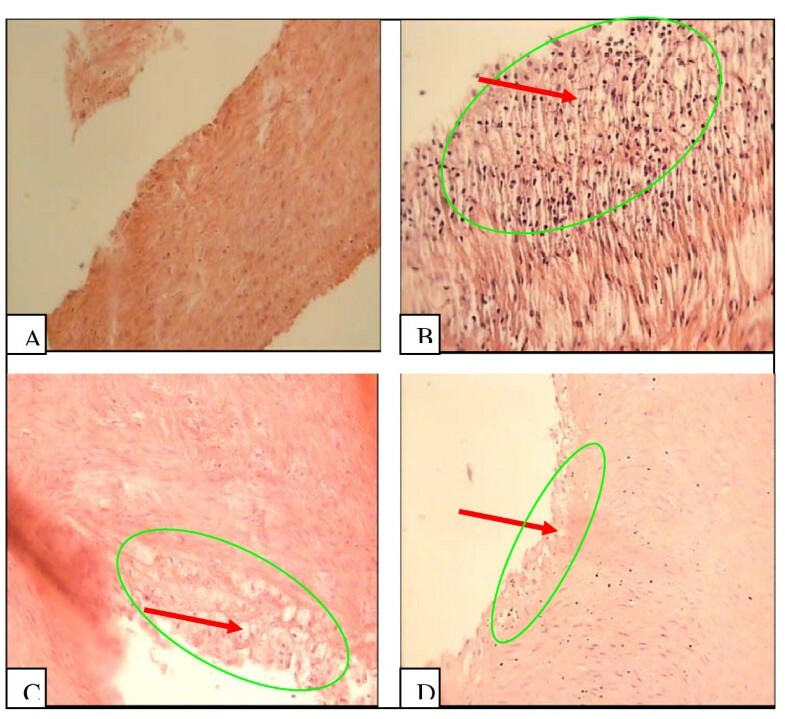 Atherosclerotic changes were absent in normal diet group (Fig 1a, 2a), whereas in the intimal surface of the coronary arteries from high-cholesterol diet group were seen many fat-laden macrophages. The cytoplasm of the macrophages filled with lipid droplets (foam cell) as the result of lipid digestion by the macrophage (Fig 1b, 2b). In the apple juice groups some endothelial dysfunction along a few foam cell and macrophages were seen in the intimal surface of the coronary arteries (Fig 1c, d, 2c, d). Atherosclerotic thickness grade in the apple juice groups decreased significantly compared to the high-cholesterol group (p < 0.05). In prepared incisions of from high cholesterol groups, right and left coronary arteries, the atherosclerotic thickness of right and left coronary arteries was 3.47 ± 0.37 and 3.28 ± 0.26, respectively and the plaque degree in both was 3. In 5 ml apple juice with cholesterolemic diet, the atherosclerotic thickness of right and left coronary arteries was 1.4 ± 0.26 and 1.92 ± 0.55, respectively and the plaque degree for both was 1. In 10 ml apple juice with cholesterolemic diet, the atherosclerotic thickness of right and left coronary arteries was 0.85 ± 0.36 and 0.92 ± 0.53 and plaque degree for both was 1. Right Coronary artery intima cross-section in the studied groups. Grade 1: Plaque less than half as thick as the media with some form of endothelial dysfunction. Grade 2: Plaque at least half as thick as media with accumulation of intracellular lipid, macrophages, and smooth muscle cells. Grade 3: Plaque as thick as the media with an abundance of macrophages, smooth muscle cell, and connective tissue. Grade 4: Plaque thicker than the media with a large extracellular intimal lipid core and inflammatory cell infiltration (Chekanov, 2003). Left Coronary artery intima cross-section in the studied groups. Grade 1: Plaque less than half as thick as the media with some form of endothelial dysfunction. Grade 2: Plaque at least half as thick as media with accumulation of intracellular lipid, macrophages, and smooth muscle cells. Grade 3: Plaque as thick as the media with an abundance of macrophages, smooth muscle cell, and connective tissue. Grade 4: Plaque thicker than the media with a large extracellular intimal lipid core and inflammatory cell infiltration (Chekanov, 2003). The significant decrease in CRP, fibrinogen, factor VII, TC, TG, LDL-C and the significant increase in nitrite, nitrate and HDL-C in rabbits receiving apple juice as compared to the high-cholesterol group represent that this extract is effective in moderating the dyslipidemic condition arising from a high cholesterol diet. Histological results indicate that apple juice significantly reduced atherosclerotic lesions of coronary arteries, when compared to the high-cholesterol groups. In our study, nitrite and nitrate increased in high cholesterol control compared to normal diet. It has been suggested that enhanced NO synthesis might be a defense mechanism to compensate for continuous inactivation of NO and protection against damaging factors . The proposed mechanism responsible for the increase of nitrite and nitrate may be a significant increase in overall NOS synthesis by other cell types (than endothelium) in advanced lesions composed of the endothelial, neuronal and inducible isoforms of nitric oxide synthase (iNOS) enzymes . Both low and high-doses apple juice with cholesterolemic diet caused significant increase in nitrite and nitrate compared with high cholesterolemic diet. The release of nitric oxide (NO) by a healthy vascular endothelium, which consists of a single layer of endothelial cells, prevents the adherence of platelets and leukocytes to the arterial wall. Therefore, reducing platelet activity could reduce athero-thrombotic events . In addition to its antiatherogenic properties, NO also stimulates the vascular smooth muscle to relax and produce vasodilation. However, the endothelium can be damaged by many of the known vascular disease risk factors such as hypercholesterolemia, hypertension, and diabetes, thus reducing the bioavailability of NO. The release of ROS is increased in states of oxidative stress and neutralizes the beneficial effects of NO by converting it to peroxynitrite . The increase in NO and decrease in ROS attenuate multiple mechanisms that are central to the development and progression of atherosclerosis. The biological activity of NO can be effectively increased by the scavengers of oxygen-free radicals . However, polyphenolic compounds can increase the NO releasing by two mechanisms: 1-Stimulation of NO synthase activity and preservation or stabilization of NO release under basal conditions. 2- Protection of NO from destruction by superoxides and other free radicals . Schuldt EZ et al reported that polyphenols were able to scavenge free oxygen radicals to a limited extent resulting in an increased NO level . Diets rich in dealcoholyzed red wine (DRW), quercetin or catechin induced endothelium-dependent vasorelaxation in rat aorta in a resting state through the enhancement of NO production, without modifying O2- generation, thus the bioavailability of NO was increased. The increase in the NO-cyclic GMP pathway explains the beneficial effect of flavonoids at vascular level . Following concurrent use of 5 and 10 ml apple juice with cholesterolemic diet, fibrinogen and factor VII levels were significantly decreased in comparison with high-cholesterol group. Studies show that red wine consumption caused significant decreases in fibrinogen and factor VII [28, 29]. In a study by Grenett HE et al in rats, the impact of polyphenols on expression of fibrinolytic protein [urokinase-pA(u-PA), (t-PA), (PAI-1)] mRNAs in endothelial cells of aorta was evaluated. The expression of t-PA and u-PA mRNA was up-regulated, but conversely PAI-1 mRNA expression was down-regulated by both ethanol and polyphenols including catechin and quercetin. As a result, the firbrinolysis was increased in rat endothelial cells, an effect which might exert a beneficial cardio protective role . The individual polyphenols of apple juice and ciders were examined for their ability to inhibit tissue activator, urokinase and plasmin. Neither phloridzin nor chlorogenic acid had any inhibitory activity at concentrations of 500 micrograms/ml while epicatechin had only a slight inhibitory effect at this concentration . Using both doses of apple juice with cholesterolemic diet induced a significant decrease in CRP compared to hypercholesterolemic diet. In high cholesterol group, CRP was increased significantly compared to the normal diet group; however it has been shown in another studies with hypercholesterolemic rabbits [32, 33]. C-RP may actively promote atherogenesis , causing lesion formation via mechanisms such as endothelial dysfunction and leukocyte activation  and changes in plaque structure resulting in stability reduction and enhancing rupture. Many reviews aimed to study the effects of flavonoids on inflammatory processes  which showed that they may inhibit some active enzymes during the inflammatory process . Isoforms of iNOS and of cyclooxygenase (COX-2) are responsible for the production of prostaglandins and nitric oxide biosynthesis which act as a mediators. In vitro studies have demonstrated that nitric oxide production and the expression of iNOS inhibit by flavonoid quercetin . Flavonoids can modulate the molecular events cascade in several critical steps resulted in iNOS or COX-2 over expression. It seems that activation of a transcription essential for the expression of proinflammatory genes, the nuclear factor kappa B (NF-kappa B)converge the iNOS and COX-2 induction pathways . Some of inducible transcription factors can constitute potential key targets for the treatment of the inflammation and NFkappaB is one of the most important of them which can trigger a cascade of molecular events by its modulation. It is showed that CRP protein level in hepatic cells may reduce by diverse flavonoides and that the effect is dose-dependent . Studies indicated that CRP can be induced by IL-6 mechanism that involves NF-kappaB activation [41, 42]. An inhibition of the nuclear NF-kappaB translocation and of CRP synthesis in hepatocytes can cause by alterations in the intracellular state redox . So it is possible that effects of flavonoids on CRP expression could be mediated, at least partly, by the modulation of the NF-kappaB-dependent pathway. Results of Golzarand M et al showed that ingestion of apple cider vinegar in patients with type 2 diabetes had no effect on CRP but it reduced IL-6 concentrations . Findings of Chung OK, et al demonstrated that intake of dietary flavonoids is inversely associated with serum CRP concentrations in U.S. adults. Intake of flavonoid-rich foods may reduce inflammation-mediated chronic diseases . Studies of Terra X, et al indicated that the procyanidins of grape seed decrease plasma CRP levels in rat. The decrease in plasma CRP in hypercholesterolemic rats is related to a down-regulation of CRP mRNA expression in the liver . We showed that dietary consumption of 5 and 10 ml apple juice with cholesterol diet significantly decreased serum TC and TG. Aprikian O, et al  found that when cholesterol fed rats were supplemented with lyophilized apples, there was a significant drop in plasma cholesterol and liver cholesterols and an increase in high-density lipoproteins (HDL). Furthermore, they found that cholesterol excretion increased in the feces of rats fed apples, suggesting reduced cholesterol absorption . Also, Aprikian O, et al  in more recent studies, found that combined apple pectin and apple phenolic fractions lowered plasma and liver cholesterol, triglycerides, and apparent cholesterol absorption to a much greater extent than either apple pectin alone or apple phenolics alone . Histological results indicate that apple juice intake reduced atherosclerotic lesion in coronary vessels significantly with compared to hypercholesterolemic group. Because inflammation has an important role in atherosclerosis development, significant reduction in inflammatory lesion may be due to anti-inflammatory effect of apple juice. The protective effects of flavonoids against chronic diseases have been attributed to their free radical-scavenging property. In the case of CVD, flavonoids have been shown to reduce low density lipoprotein (LDL) oxidation, an important step in atherogenesis [49, 50]. Hung MT, et al  has suggested that polyphenolic compounds inhibit proinflammatory cytokines expression including IL-6, IL-1 and CRP expression. Apple was identified as a major dietary source of flavonoids especially flavan-3-ols (catechins) in the epidemiologic studies that inhibits cyclooxygenase enzymes [52, 53] that produce inflammation and stimulate inflammatory responses in body . Studies by Decorde K, et al indicated that phenols of grape, apple and their juices reduce atherosclerosis lesion in hamster. This value was reduced by %93 in grape juice,%78 in purple grape,%60 in apple juice and %48 in apple. In study performed by Da Luz PL, et al on the effect of red wine on experimental atherosclerosis, the rabbits that given red wine had significantly less atherosclerotic plaque development in their arteries than those not given wine at all. In conclusion, results of this study suggest that hypercholesterolemic atherosclerosis is associated with an increase in oxidative stress in coronary arteries and that apple juice is effective in reducing hypercholesterolemic atherosclerosis by lowering levels of fibrinogen, VII, CRP, TC, TG, LDL-C and raising levels of nitrite, nitrate and HDL-C. Therefore, apple juice may be useful in preventing hypercholesterolemic atherosclerosis and lowering the related risk of coronary artery disease. This study was supported by Isfahan University of Medical sciences; Isfahan, Iran and Isfahan cardiovascular research center Isfahan, Iran. AHR participated in the sequence alignment and drafted the manuscript, NE carried out the laboratory tests. AE participated in the sequence alignment. MS participated in the design of the study and performed the statistical analysis. SA conceived the study, and participated in its design and coordination. All authors read and approved the final manuscript.